Security cameras are types of cameras used for monitoring and observing a specific environment or place. These kinds of cameras are highly demanded safety purposes as well as for monitoring as to what’s going on in areas beyond ones’ reach of visual capability. 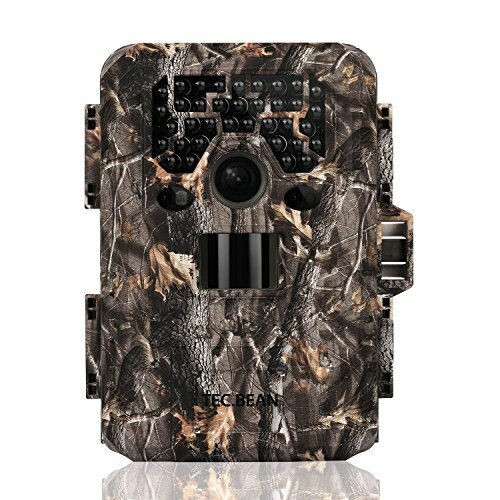 The TEC BEAN Trail Camera is one of the gaming cameras that can also be used as a security camera. It has an HD resolution capability that provides 12MP color images and 1920*1080p HD videos. The video recorded by the camera has an audio recording along with it which can last up to 90 seconds. The camera provides a vivid view of the environment that takes up nine photos per trigger in the span of 0.6-0.8s. One if its feature is its fast trigger speed with a speed capability of 0.8 seconds trigger that captures any movement before the lens. For nighttime vision, the camera has 36 pieces of no-glow IR LEDs which can extend its vision range up to 75ft/23m. 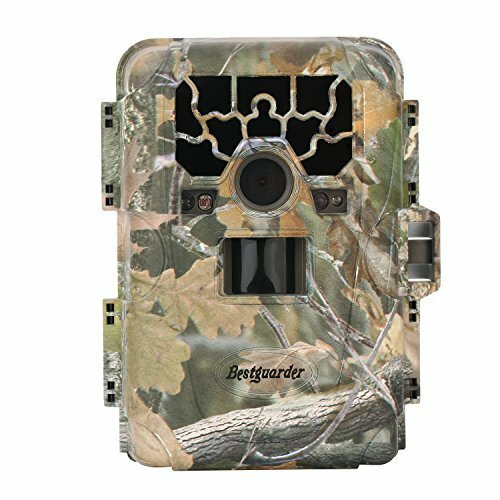 The camera provides the user with an option of hybrid mode for fast-paced action depending on different hunting situations. It also detects motion of any targets in any degree of temperature for security assurance. It has an IP66-rated waterproof case and password protection grant to double up the security of the camera itself. The camera has a low-battery consumption rate which can last up to 8 months. Though, for security assurance, its motion sensor during nighttime can be slow depending on how it is positioned. Make sure to place it where there is a low touch of light where subjects can easily be recognized. The camera also has a strap that is visible which can be spotted easily. As a user, one needs to take extra precautions in setting up the camera in a proper position to make its function effectively as a security camera. 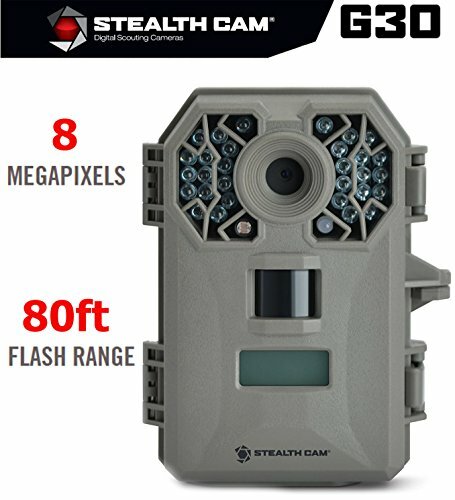 The Stealth Cam 8 provides new features which can be used for security purposes. The user has an option to choose from 8MP/4MP/2.0MP depending on what quality image s/he wants to be captured for a specific purpose. It records HD videos that last from 5-180 seconds. The camera is equipped with 30 IR emitters that can reach up to 80ft range. Along with it is an automatic trigger within the span of .5 seconds. The camera also features a matrix blur reduction for sharp images of targets. The camera has a manual shot capability that lets users capture specific situations at their cost. It has a secure lock password protection which assures the security of the camera itself from intruders. It is capable of 32GB SD cards for storage of images. Though the camera is good to be motion sensitive, it causes an overload of pictures in the camera which are not all useful. A slight movement in the field can be detected and captured by it. Also, the nighttime feature does not provide a specific exposure time to stop the movement of targets. This is a need for recognition of subjects walking around the area. For better quality pictures, place the camera somewhere clear and free from unnecessary movement of other tiny objects to avoid the wrong capture of targets. IR lights can somehow be bright from afar which can lead to intruders to easily notice it. The Day 6 Plotwatcher Game Surveillance System captures images for every 5 to 10 seconds that can function for the whole day. 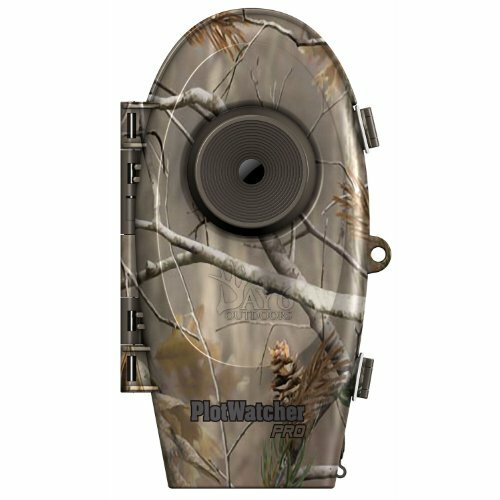 For hunting purpose, hunters are provided with a potential hunting spot without doing a manual scouting location. It has a 5-inch LCD for onboard camera setup and captures up to 1 million video images, The camera has a GameFinder software that reviews files in forward, reverse or scroll frame by frame. It is capable of recording 1,280 x 720 video resolution with an audio recorder. It is compatible with an SD card up to 32 GB. It features a time-lapse interval on the selector wheel, which allows a frame to frame trigger. It also has an inserter for a drive which makes it connected to a TLV unit to make the scouting process easier. Good quality but not the best resolution so too much zoom can cause pixelation of the images. The Bestguarder camera provides 12MP images with full-color resolution. It takes up to 9 pictures per trigger at around 0.6-second trigger speed. The camera records 1920x1080p video resolution with an accommodated audio. The camera is triggered by movement, detected by a highly sensitive PIR motion sensor. It has 36pcs Black IR LED that allows the camera to capture images and videos during daytime while black and white during the night. It can position up to 75 feet/23m distance, which is monitored by ICR for color images/videos during day and night, It provides HD video with sound and an illumi-night sensor that clear and accurate nighttime photos. It simultaneously captures images and videos on every trigger under the Hybrid model. It also features a Time Lapse program makes the camera capture images at preset time intervals regardless if there are motions detected. 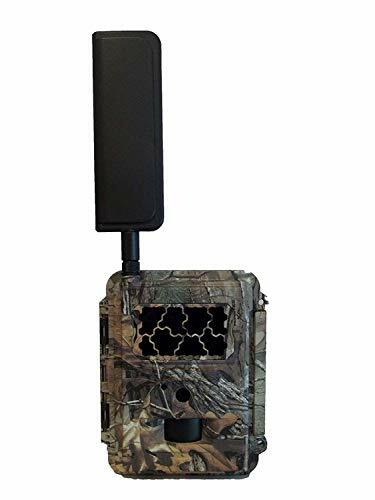 It is designed to be a professional trail gaming camera so better build up some patience in knowing how to manipulate this tool for it could take a lot of time. But once you’ve learned how to maneuver it, it is one of the recommended tools as a security camera. This camera is connected to AT&T network. 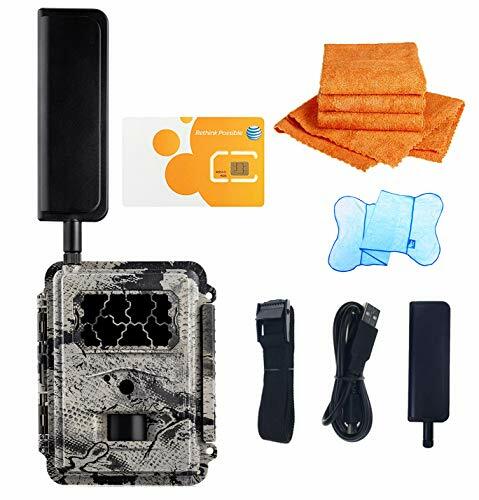 It has a Data Connect Pass SIM card which makes the user easily activate the service at the AT&T service site to use the camera menus in setting up the desired picture parameters. It is powered by 12 AA batteries and serves a standalone installation with no requirement of wires or external power source. The Spartan GoCam features a quick follow up trigger speed. Its IR LED array covers an illumination of the area up to 70 feet for clear night images and videos. The camera’s photo resolution can be set up to 8 MP. On the other hand; its video resolution can be set up to 720P if you are using the camera as a standard trail fitted for security purpose. The camera can automatically overwrite the oldest photo on the SD card with the most recent ones if the SD card is already full. You can set the camera for one or two duty periods, each with different trigger intervals and time-lapse settings to avoid unnecessary capture of images. For the camera’s water resistance, it has an oversized rubber gasket on its front case half the same with an oversized double-hinged latch that can be easily operated with gloved hands. Though it is connected with AT&T network, a part of its drawbacks needs a secure web connection to maximize its connectivity and function. Works hard connecting reliably on the AT&T network. This camera has a built-in 2.0″ TFT LCD with Burst Rapid Fast Fire Continuous Shooting. It takes up to 9 pics at around 0.6-0.8s trigger speed time. It features a timer switch and programmable time-lapse mode which lets users take images at preset interval settings. 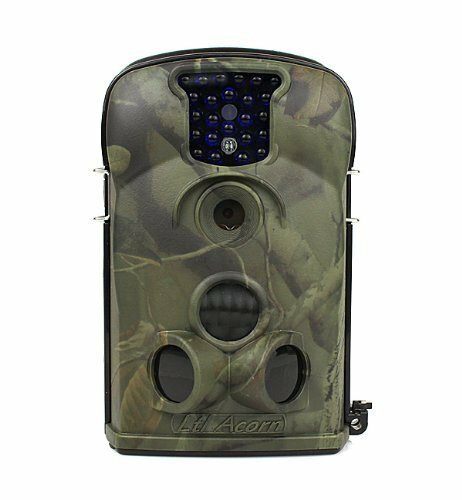 The Flexzion game camera provides 12 Megapixel full-color images. It records in high-quality resolution at the specs of 1080P x 720P HD video with an audio accommodated. The camera automatically switches in low ambient light to the night vision mode depending on the time of the day. It has motorized ICR filter for full color or black and white photos and videos. It is equipped with 36-no glow black IR LED night vision flash which enables long-distance detection range from 23 meters or 75 feet. This feature allows capture of clear nighttime images and videos in black & white even in the low ambient and night. It has an adjustable PIR motion sensor which can be useful for surveillance security. It highlights its particular hybrid mode that simultaneously captures full resolution images and videos for every trigger. It has an additional battery pack and solar panel connection for extension of the camera’s working time. It is a professional camera that requires patience in setting it up. Its instruction manual is a bit small to be readable so better be ready in learning how to manipulate this tool. The instruction booklet is unreadable. The LTL Acorn camera provides 5 Megapixel images with full color. It functions with an SD Card of 8MB to 16GB. It has a F=3.1mm lens with a temp of FOV=52°. It features an auto IR-Cut Pixel Size of 2560 x 1920. The camera has an LCD Screen of 48×35.69mm. Its picture quality can be chosen from around 5-12MP. You can also select its video resolution between 640×480 and 320×240. It has a day and night PIR Sensor sight angle of 100 degrees. Each lens covers a PIR Sensitivity of 10 degrees. You can choose from its three levels of sensitivity to High, Normal or Low. Its trigger time runs around 1 second with a triggering interval of also 1 second up to 60mins. It takes up to 3 images per interval. The camera has an IR Flash that can reach up to 65feet/20meters. This provides the user with a precise and accurate picture even at night. The camera functions with 4AA batteries and requires a power consumption of 150mA. It is accommodated with an external mounting belt when needed to place it on posts or trees for security purpose. However, when it comes to adjusting the menu system, you are required to place an SD card for the camera to allow access in its menu. This camera model provides 12 MP photos and records videos of 1080P (1920×1080) resolution. It has an IP 54 waterproof feature which makes it suitable for outdoor or indoor activities. The camera features a time-lapse model which makes it possible to capture movements of subjects frame by frame which is highly relevant when it comes to security purpose. It also has a built-in 2.0 viewer LCD for good monitoring and accurate capture of the camera. The voltage consumption of the camera is 12V and it is supplied by eight AA alkaline batteries. Though, it needs to be a battery that works compatibly with the camera and is of good brand and quality. 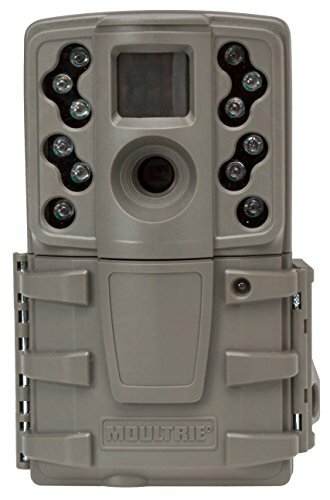 Unlike usual trail game cameras, this needs to be kept far away from heat source or what that can affect its temperature. This is to avoid any false trigger and shortening of the camera’s life. The Spartan GoCam is accompanied by Verizon Custom Machine plan. The user just needs to merely activate the service from HCO and camera menus are ready to use for desired picture parameters. The camera is supplied with 12 AA batteries and is a Standalone installation with no requirement of wires or any external power source. Images in the camera can be transmitted with or without AES 256 encryption, though for security purposes, you can use the encryption to transfer your photos. The camera is triggered with its PIR motion sensor with a trigger speed around 1 to 1.5 seconds. The picture will automatically transmit on an average of 25 to 30 seconds. Though it is evidently advanced in some aspects, some features of the camera can only be determined once the parameters are set before actual use. 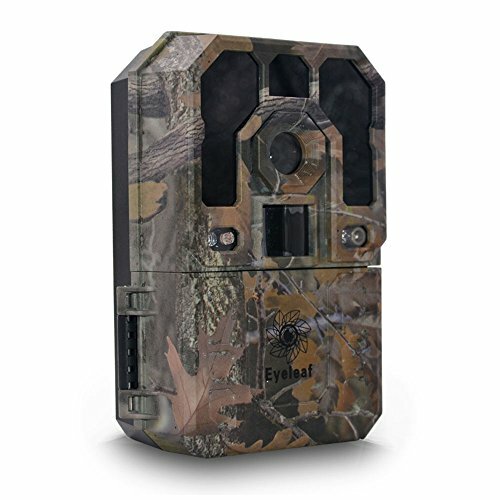 Moultrie A-20 provides 12-megapixel resolution of images. It has a weather-resistant exterior, an LCD screen, and a power supply that runs on AA batteries. The camera is equipped with 32 LEDs and 850 nm nighttime infrared technology that illuminates the environment up to 50 feet away. 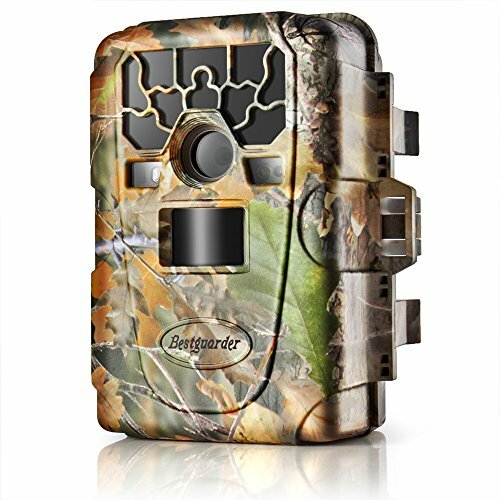 The camera features multi-shot and single-image modes which offer hunters customizability. It has a sturdy case with a weatherproof plastic exterior that comes with standard 1/4″-20 bottom tripod mounts. It can be accompanied with back slots for use and an included nylon strap and lock cable for tree mounting. The camera works with Class 4 SD cards or higher that can handle up to 32 GB for many images. Its power supply requires 8 AA batteries which can last in capturing approximately up to 16,000 images. Though the problem is, there is no setting for its motion sensitivity. The camera’s motion detector is a bit laggy so better place it somewhere it can spot easily anything that moves around the area.